Is anyone serious about reconciliation? This entry was posted on 22/06/2018, in Analysis, Anecdotes, Corruption and Cheat, Crime and Cruelty, Culture and Traditions, Hard Facts, Hypocrisy, Laments, News | Newsmakers, Reconciliation, Tragedies and tagged sinhala buddhists, Tamil-Muslim-Malay. Bookmark the permalink. What reconciliation are these Sinhala leaders talking about? 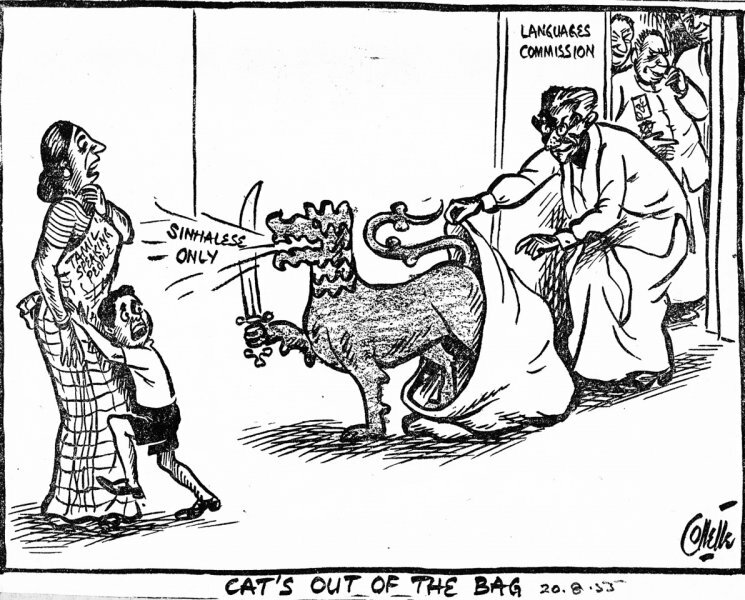 IF reconciliation is not between Sinhala and Tamil, then between whom is it? The week before last, I listened to Episode Five of my favourite radio programme Naada Sittam aired by SLBC on Tuesday nights, sponsored by the Sri Lanka Arts Council. A programme that’s researched, edited and presented by Vishnu Vasu, an Indian trained Sinhala Buddhist Gatam expert who is well versed in Dravidian music and in all aspects of Sinhala culture. While Sinhala music is grounded on the Hindustani Music tradition, better known as Uttara Bharatheeya music tradition taught in schools and in universities for many decades, Vishnu Vasu presented proof of the influence the South Indian Dravidian musical traditions have on Sinhala music. He traces the influence of South Indian musical traditions at the beginning of the Sinhala cinema that was pioneered by a Tamil, S.M. Nayagam. Setting the records straight, he notes that the film Kadavunu Poronduwa produced by Nayagam, premiered at the Kingsley Hall, Colombo in 1947 January was graced by then Minister of Agriculture, D.S. Senanayake. In this musical milieu within which Sinhala music and song grew with music Gurus like Sunil Santha, Amaradeva, Somadasa Elvitigala, Premasiri Khemadasa, different genres were explored and developed, each with his own versatility. Yet, who would ever think the greatest musician and singer of the Sinhala South the late Amaradeva was also greatly influenced by Dravidian music? It was an amusing surprise to listen to Amaradeva’s original rendition of the song Premathata kayamekayimanike with Vajra Balasuriya, penned by Sri Chandraratna Manawasinghe, alongside the Tamil song Kaliyugavaradan, kankandadevaneyam. Amaradeva was not just influenced by the song composed and sung by the Tamil Nadu musician Periyasamy Thooran in 1908 as diplomatically put by Vishnu Vasu. Without a doubt, Amaradeva’s version was a direct adaptation of Periyasamy Thooran’s Tamil song. As mentioned by Vishnu Vasu, almost all who contributed to Sinhala music and song in the past were Tamils and Muslims. The lineup would include Mohamed Ghouse, R. Muttusamy, A.M.U.Raj, M.K. Roksamy, Lakshmi Bhai and the more popular late Harun Lanthra and Mohideen Baig among others. They gave life to Sinhala music and song from the 1940s to the late 50s and singers like Lanthra and Baig continued even into the 70s. Having comfortably forgotten that in the past Sinhala music and song began with Northern Hindustani and South Indian Dravidian influence and continues to date, we have also forgotten that the Sinhala language itself is a highly pickled language like English that has been enriched through heavy assimilation of words borrowed from other languages. The most important fact is, these borrowed words provide us with essential words for conversation and communication in daily life. The Tamil language thus dominates but so do other borrowed words that came of late. Think of those poor rural women who come to Colombo to have their “visa” to migrate as housemaids to the Middle East. Neither of them nor we have any Sinhala word for “Visa”. No Sinhala Buddhist patient can ever Channel a Specialist Doctor in any other word. You can never search Google without a Router and Wifi in your laptop and they have no Sinhala substitutes. No one can ever travel directly from Kirulapone to Maharagama other than on the High-Level Road. That has become more or less the official Sinhala name for High-Level Road right up to Pahathgama, Hanwella. You would not find the Fax machine in any other word in any office. Shirt or kamise, kalisama, sapaththu, sereppu, saree, that you would wear before getting onto a bus or car and even lorry are all borrowed words. Your salary is earned and not borrowed money. But the word padiya is borrowed from Tamil. So are common meals in Sinhala South with paan and pol sambol for which red chillies came with the Portuguese. Maldive fish came with the Muslim traders for the popular Katta sambole. It is Dutch architecture that dominates the landscape in Colombo city and suburbs, and if not for the Dutch most ‘traditional’ sweetmeat like kokis, aasme, kevun on the Sinhala Avurudu table would go missing. Our daily attire is no more what Robert Knox describes. No more cloth draped around above the waist to knee high or below. No more bare-breasted women in public. Slacks and then Denim from the Imperial West is now the daily dress. Even in the remotest Sinhala village, the sarong would not be the ordinary man’s common dress if not for the Malays. The more important fact is that the Sinhala Buddhist history is no Eskimo history of isolation. It is a history of cultural engagements and assimilation over Centuries. It is integrating with and borrowing from other cultures and assimilating them over time that created and established the Sinhala Buddhist cultural identity with Hindu Gods and Goddesses, kovils within temple premises and rituals borrowed from Hindu religion. A long process that began from King Devanam Piyatissa era and continues to date. And with every borrowing and digesting whatever possible and convenient to our own liking has made Sinhala Buddhists feel richer and not poorer. This historical fact needs to be brought to open discussion if political leadership believes there needs to be the reconciliation for a new future free from ethno-religious conflicts. This fact that Tamil, Muslim, Malay, Dutch and British cultures added much in creating the Sinhala Buddhist identity and making them proud they have a rich culture, has to be publicly said and accepted to help Sinhala Buddhists face reality. The fact Sinhala Buddhist cultural identity evolved through many “mixed marriages” needs to be highlighted for Reconciliation to become a living process. Sadly, Reconciliation as interpreted and carried out by political leaderships both in and outside Yahapalana government, is reduced to rhetoric with the wrong and dangerous perception that Sinhalese are a ‘uniquely pure ethnicity’ and are sole owners of this little island. They have for the benefit of that deformed dominant mindset, continue to dole out infrastructure projects to the North and East as decided by Sinhala leaders in government and call it “reconciliation”. Reconciliation as serious social dialogue and active engagement is thus kept out of the Sinhala society in order to exploit votes at elections on Sinhala Buddhist sentiments. From 1948 Independence, 35 years of denying the Tamil polity their due share in policy and decision-making in an inclusive, secular State, was marked by making Sinhala the only official language in 1956, shelving the B-C Pact in 1957 and letting off anti-Tamil Communal riots in 1958, when Prabhakaran blamed for the ‘separatist war’ was only a four-year-old toddler. With more added against the Tamil people over the years led to 26 years of a brutal and a devastating war from 1983 and another nine years of post-war denial cannot be reconciled by keeping the Sinhala South as mere outsiders. Sinhala South has to be brought in as the active and important participant in bridging the huge “trust deficit” for reconciliation to begin. Reconciliation is nothing but bringing two estranged parties together in understanding each other. There is a not just a lack of political will, but a ‘Sinhala bias’ too that keeps reconciliation away from Sinhala South. What is said for media consumption by political leaders is therefore not translated into political action. What they fail to and do not want to understand is that the moderate and majority Sinhala Buddhist in rural South are not racist campaigners like the urban Sinhala middle-class that fall in line with Sinhala Buddhist extremism. Thus there is no loss of Sinhala Buddhist votes, but more votes across all ethnoreligious divides, if there are any who would boldly face up to the task of reaching the Sinhala South for reconciliation. « If Gota is going to be President………..